An easy accessible instrument for ages three and up. 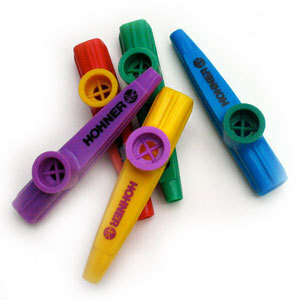 The kazoo utilizes your own voice but transforms it into a buzzing sound that's great for a light-hearted approach to music. Hear it on Jack's song, "Rhymin' Away With Ol' Dr. Seuss," among others. It comes in a variety of colors and is made of a sturdy plastic. The membrane can be replaced if necessary, so don't lose it and you can pass your kazoo on to your grandkids!